A Nottingham brewery has created a hybrid drink made from the fermentation of both malted grains and Pinot Grigio grapes – a drink that is neither beer nor wine, but ‘bwine’. 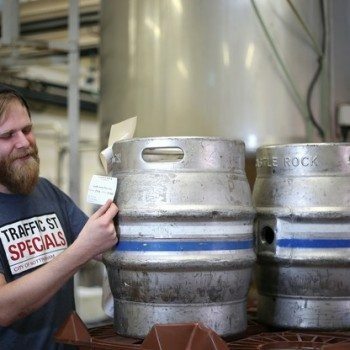 Flouting the cardinal tenet of folk drinking wisdom – grape or grain but never the twain – Castle Rock, Nottingham’s biggest brewery, claims the new drink is the first ever real ale and white wine hybrid. Half pale ale and half Pinot Grigio, the 7.7% ABV beer is called New Era and is the latest in the brewery’s Traffic Street Special series – an experimental project operating alongside the production of its more established brews. Brewer Dan Gilliland was inspired to produce the New Era bwine by the American brewery Dogfish Head, which is well known for creating eccentric brews. “I came across this particular type of beer from a brewery in America who had sent an archeologist out to look at some dig sites in Egypt,” Gilliland told the Nottingham Post. “They came across some residue in a vessel about 5,000 years old that found the general practice was to use a variety of different sugar sources to produce alcohol beverages – including malts, honey and grape juice mixed together. Gilliland said the New Era involved brewing a classic pale ale, then mixing in Pinot Grigio grape juice and Champagne yeast to induce a secondary fermentation. The beer will be launched at the Canalhouse bar in Canal Street, Nottingham, on 21 January, and will be available in Castle Rock pubs across the city for a limited time. This is already an entire genre of Italian beer.